One of the operation of the shell when it analyzes the input is Shell expansion. Bash provides different types of expansion. In this article let us review an important expansion — “Brace expansion”. Brace expansion is used to generate arbitrary strings. Brace expansion allows you to create multiple modified command line arguments out of a single argument. The specified strings are used to generate all possible combination with the optional surrounding preambles and postscripts. The preamble is prefixed to each string contained within the braces, and the postscript is then appended to each resulting string, expanding left to right. The above echo statement avoids you to specifying the three log files separately. If you want to view the content of the last boot log, mce log and xorg log you can use the brace expansion as shown in the above echo statement. In the above backup script, it copies the current date log file with the extension .bak. The first element is empty in the braces, so first element will have only preamble. In the restore script, the first element in the parameter is .bak where as second element is empty. Also, refer to our earlier article on bash shell functions for additional reading. If there is no preamble and postscript, it just expands the elements given in the braces. Brace expansion expands the sequences also. The sequences can be of integers or characters. The first cat command, expands messages.1,messages.2 and messages.3 and displays the content. and in the next echo statement character and integer sequences are combined and used. In kshell brace expansion, you can use increment value, to generate the sequences. incr is numeric. You can use a negative integer, but the correct sign is deduced from the order of start and end. Using this you could see the alternate days logfiles. 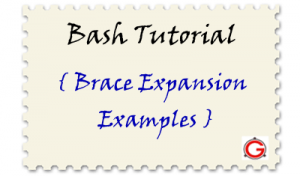 Brace expansion does not expand bash variables, because the brace expansion is the very first step of the shell expansion, variable will be expanded later. If you see the output of the following two for statement, you could identify the above pitfall. # Print 1 to 4 using sequences. echo "Sequences expressed using variables"
With respect to using “seq” ; that isn’t portable. It exists on Linux only. BSD’s use “jot” Solaris has no equivalent; but I am not a full time Solaris Admin. Keeping scripts portable is a good thing; why write and rewrite and maintain the same script for various OS. IMHO it’s better to keep things portable.